The South Korean "Son" is still shining brightly over London. 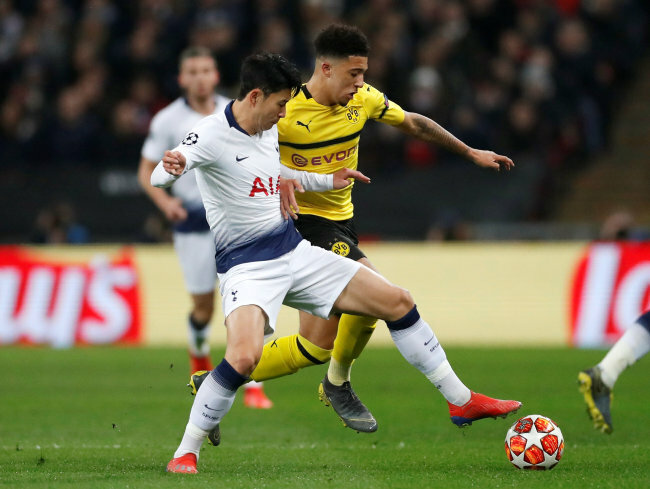 Tottenham Hotspur's Son Heung-min netted the opening goal in the team's 3-0 victory over Borussia Dortmund in the first leg of the round of 16 at the UEFA Champions League at Wembley Stadium in London on Wednesday (local time). Son has now scored in four consecutive matches, with his three previous goals having come in his last three English Premier League contests. Son's score in the 47th minute stood as the eventual winner, with insurance goals coming from Jan Vertonghen and Fernando Llorente later in the second half. The South Korean attacking ace volleyed home a cross from Vertonghen to break the scoreless deadlock against Dortmund. It was also Son's first goal in the Champions League this season in seven matches. For the season, Son has 16 goals in 32 matches across all competitions. The second leg of the round of 16 will be at Westfalenstadion, Dortmund, on March 5, with the Spurs in the driver's seat after the breezy opening victory.